Subscribe Today for Your Piece of American History! Red Power Magazine is a 100 page bi-monthly magazine published six times a year: January, March, May, July, September, and November. 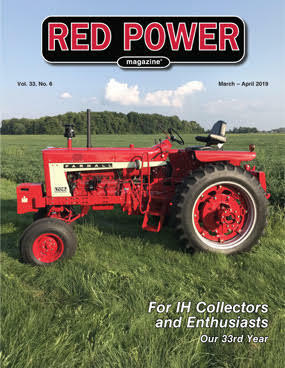 Information and articles on IH / Farmall / McCormick farm equipment, parts, trucks and light duty pickups, construction equipment, equipment built for military uses, collectibles, toys, company history, garden & lawn equipment, classifieds, shows & demonstrations, and many more features and articles too numerous to mention. Advertise in Red Power Magazine! 20 cents per word ($4.00 minimum) $20 extra charge per photograph ($24.00 minimum). Photos must be IH items. Classified ads will not be billed and must be paid in advance. Ads received after deadline will be placed in the next issue of Red Power. Classified ads will be taken over the phone, if accompanied by a credit card payment. Not responsible for errors in ads taken over the phone or for illegible ads received in the mail. $20 extra charge per photograph. ($20 charge for returned checks) There will be an ad preparation charge if the ad is not in a useable format or ready to print. Questions?? Call 712-364-2131 for more information. All advertising must be paid in advance. Ads sent without payment and needing to be billed will be assessed a $4.00 service charge. Display ads will not be taken over the phone. Do not send camera-ready material via fax. We do not send checking copies or tear sheets. Send $5.00 extra for a copy of the issue in which your ad appears. Red Power magazine does not knowingly accept dishonest or misleading advertising, and cannot be held liable for the claims of its advertisers. Deliberate misrepresentation will lead to cancellation of advertising privileges. Ads due by the 1st of the month before publication date. $20 extra charge per photograph if needing to be scanned. Business cards will be printed for $45 per insertion for b/w. All advertising paid in advance. Red Power Magazine reserves the right not to print any ads which it considers offensive or proven to be dishonest. Ads may be e-mailed to : dmiesner@netllc.net and payment can be made over the phone with a credit card.